Quickly closing in on the 20th anniversary of the storied sneakers, the Air Jordan shoe line from Nike remains the biggest draw for sneakerheads. Although many of the original shoes have already seen retro releases and new colorways and variations, some early editions continue to hold a special place for shoe collectors. High on that list is the very first signature shoe for Michael Jordan, the Air Jordan I. On December 28th, the Air Jordan I Retro "Bred" was released and it is expected to be one of the most popular shoes of 2013. The original Jordan sneaker is significant because it marked the beginning of the Michael Jordan-era of NBA basketball. 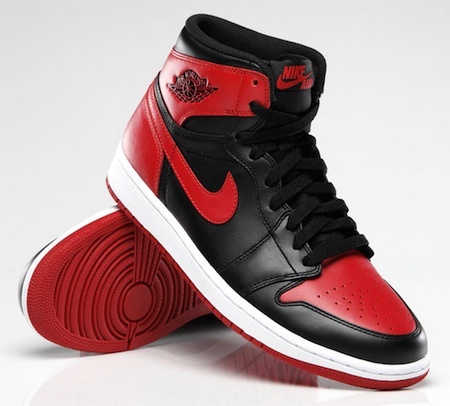 Although there were several different color combinations, the black and red, or "BRED," is the most synonymous with the original shoe. This shoe was also the reason that Michael Jordan was issued fines from the NBA for not adhering to the dress code. At the time, the NBA required white to be included in the shoes worn on-court, and Jordan was fined $5,000 per game for breaking the rules. Nike had fun with the publicity and as Jordan continued to wear the "banned" shoes, sales began to skyrocket. This is not the first retro edition for the Air Jordan I to feature the red and black color scheme, as a very similar sneaker was released a few years ago. The Air Jordan I Retro "Banned" was rumored for some time before it unexpectedly appeared at Nike Factory stores in June of 2011. Only 9,000 pairs were reportedly released, with approximately 160 per store. This release features an "X" on the heel and the interior includes the date that the shoes were "banned" from the NBA. The Air Jordan 1 Retro "BRED" sneaker retails for $140, but the limited supply is expected to dry up and prices will climb.